Dating back to the 17th century, the charming Billum Kro is situated 6.2 miles from the shores of the North Sea. It offers free parking and rooms with TV and a private bathroom with shower. 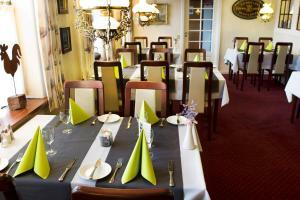 Guests at Billum can enjoy Danish cuisine with a selection of wines at the in-house restaurant. A buffet breakfast is served every morning. The TV lounge has sofas, books and board games. Guests can also relax on the terrace. Staff can help arrange green fees at local golf courses. Billum Station is located 50 yards away. 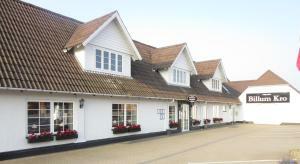 Esbjerg Golf Club is a 5-minute drive from the hotel. Den charmerende Billum Kro, som er fra det 17. århundrede, ligger 10 km fra ​​havet. Der tilbydes gratis parkering samt værelser med tv og eget badeværelse med bruser. Restauranten tilbyder danske retter samt et udvalg af vine. Der serveres morgenbuffet hver dag. I tv-stuen finder man sofaer, bøger og brætspil. Man kan også slappe af på terrassen. Personalet hjælper gerne med at arrangere greenfees på lokale golfbaner. Billum Station ligger 50 m derfra. Esbjerg Golfklub ligger 5 minutters kørsel fra hotellet.